On a magical journey through the Himalayas on the back of a crane, a brother, sister, and baby snow leopard learn the importance of our precious environment. While on a mission to find the lost leopard's home, Zompa, Gonpo, and Norbu learn responsibility for the world around them. Written in Tibetan, English, and Japanese this tale is decorated with vibrant, lush artwork that celebrates the Tibetan landscape. Rima Fujita was born in Tokyo and has lived in New York since 1979. She studied at Parsons School of Design and has exhibited her work internationally to much acclaim. 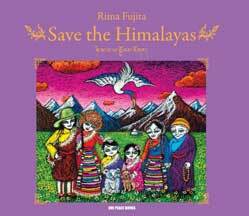 In 2001 Rima established Books for Children, an organization that produces children's books and donates them to orphans and poor children around the world. She is the author of several books, including Wonder Talk, officially selected as recommended reading by the United Nations, and award winning TB Aware. Rima has received special recognition from several Nobel Peace Laureates including the Dalai Lama, Archbishop Desmond Tutu and Betty Williams.